Paul Burgess and his paddling buddy Kevin decided to become the first people to stand up paddle around Hayling Island. Paul tells us all about the experience. Time: 6.45am on Saturday 4th April 2009. Location: West Wittering beach car park. Weather: Rainy, chilly and overcast, light southerlies. 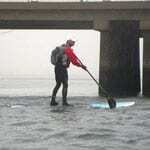 Aim: The first SUP circumnavigation of Hayling Island (as far as we know). SUB Equipment: Two 11ft x 30” Jimmy Lewis all-round boards. Problem: Hayling Island had disappeared. A thick mist had descended and we could barely see the Island at all, but we had GPS and compass, so off we set, with safety rather than distance considerations very much determining our course, and loaded up with a range of safety kit, food and drink. Within a few minutes we couldn’t see where we had come from, but the dewy mist, dawn light and calm conditions created a beautiful panorama as the local wildlife started to stir. We kept thinking that we had seen one of the families of seals that will often accompany you whilst surfing at the Witterings, but it was hard to be sure. After 5 km we consulted the GPS. Progress, although slow, was OK, a little over 3.5 miles an hour, but we were cruising not racing, and enjoying the experience. The Hayling Island circumnavigation consists of three roughly equidistant stretches. The first for us was going to be the South East point of Hayling (called Sandy Point) to Hayling Bridge, which is the northern most point. Then there is the trip south west to Ferry Point. Finally, there is the run along the beachfront, mainly heading west; and then we would hop across the entrance to Chichester Harbour back to West Wittering. The prevailing wind conditions meant the first section is likely to be the most sheltered. It was for us, with the light winds on our backs as we headed north. After about 75 minutes of paddling we approached Hayling Bridge. This is the best first opportunity for a fuel stop. At the southern end of the bridge (on Hayling itself) is a petrol station, where you can get food and drink if needed. Or if we had been doing this later in the day we could have paddled over to the Ship Inn (N end of bridge) or the nearby Royal Oak pub, both of which do good food, and you can usually sit outside so you don’t have to drip all over the bar. But it was too early for pub grub, and we had bought some snacks with us, so we stopped in the sheltered harbour area between Hayling Bridge and the remains of and old railway track that used to carry one of the earliest steam locomotives, called the Puffing Billy. These currents on spring tides mean that flows around the supporting piles of the bridge can get lively. Getting separated from your board, especially when tied to a leash, whilst approaching or passing under the bridge is unlikely to result in a happy moment. So if it looks dangerous don’t risk it. Beach yourself and cross the bridge(s) on foot. Otherwise, this area of the harbour is very pleasant, and sheltered from the prevailing winds. If you are into e.g. bird watching or fishing, you might even want to moor yourself somewhere suitable and spend some time admiring the wide variety of local wildlife. In fact, if you didn’t want to do the whole circumnavigation, the stretch from West Wittering to Hayling Bridge and back would make a good trip on its own, and might be enough paddling for most. One other thing to bear in mind is that at low tide, especially on springs, the harbour area loses most of its water and if you lost track of time in one of the local hostelries (easy to do in the summer), you might find yourself having to trudge home through footwear-sucking thick stinky mud. But didn’t have time to hang around, and 10 minutes later we were off, headed south west, past the old Oyster beds. A little-known fact is that at the turn of the last century, Hayling was famous worldwide for the quality of its oysters. Unfortunately, in 1902 the Dean of Winchester and several other diners at a mayoral banquet died after eating sewage contaminated oysters from nearby Emsworth, and the business was killed off virtually overnight. You might want to bear this in mind if you fall face-first off your board into the harbour. But if this gruesome tale piques your interest, you can see the remains of the some of the oyster beds on your left as you pass from the Puffing Billy track south-west towards the Ferry Boat. The stretch from Hayling Bridge to the Ferry Boat, at the SW tip of the island, passed in quick time, with the help of the ebb flow of the tide. You do need to watch here where you are going on this stretch if you want to minimise distance travelled. Unless you know the area well, from a mile or two away it is not easy to make out the narrow gap between Portsea and Hayling Islands that you are heading for. If in doubt, be guided by the channel markers until you can see on the horizon the large blue building. Once you can see it, head for it, because just to the right is the passage you want. On the way to Ferry Point, just before you get there is another historical curiosity, and if you have the time, you might want to take a peek at it. A large concrete structure in the middle of the channel is reminder of the part that Hayling Island played in World War two. Prior to the D-Day landings of 1944, the area around the Ferry Boat Inn was used to build sections of Mulberry harbour, which was a massive floating harbour that was towed to France as an integral part of the landings. One of the sections broke, and was abandoned in Langstone harbour, and subsequently moved to its current location. On to Ferry Point, this probably the most potentially dangerous part of the entire route. On spring tides the tidal ebb and flow through this narrow corridor can be as fast as 3 metres a second. Try paddling that fast on a stock SUB and you will see why I mention this. This tidal flow also creates turbulence, and even on occasion a kind of standing wave. At its narrowest point it is only a couple of hundred metres or so wide. This has led people (largely the inebriated) who have missed the last ferry to imagine that they can swim across the channel, with fatal consequences. Add the fact that a ferry runs across the channel between Hayling and Portsea Islands, and that Langstone Harbour and the nearby Solent regions are some of the busiest waterways in the UK for leisure craft of all sorts, and you can easily see how something unpleasant could happen here for an SUPer. Not only are there leisure craft, but there is also a busy trade in sea dredged aggregates to two commercial wharves in Langstone harbour. Approximately 500 ships of up to 80 metres length call each year with half a million tonnes of cargo. All these craft pass through a passage so narrow that you could almost throw a stone from one side to the other. So, if you are at all unsure of your abilities to negotiate this section safely, you should beach on the NE side of the passage (to the left of the large blue building in the picture), and walk your board the short distance to the end of the passage, entering the water again at the SW point of Hayling, where it is again reasonably safe. In any case, this would be a good place for a stop. The Ferry Boat Inn is a good pub, and is the best refuelling point after Hayling Bridge. To the south of the Ferry Boat there is a reasonably secluded area of sand dunes, which if you had the weather, would be a good place to relax. Although bear in mind that it does tend to attract the local nudists, which is either a bonus or horror depending on your own predilections and who you come across. We headed on without stopping, bobbing up and down over the standing waves in the channel created by the ebb tide. Some gonks in motorboats flouting the 10 knot harbour speed limit decided to buzz past and see if they could unsettle us, and Kev had a bit of a moment in their wake, from which he recovered well. By this time the weather had improved. But unfortunately our GPS now decided to give up the ghost, as seems to be the rule for these things as soon as you begin to make progress. So the last reading we had was at 16kms, when we were averaging a little over 6kms/hr, in no hurry, bimbling along quite happily. Approximately halfway along this stretch to Eastoke point (known locally as Sandy Point) you will come across the Inn on the Beach, which is another convenient refuelling stop. We beached and drank as much as we could now the sun was out, and after ten minutes later set off again. This last section is encouraging because you can so clearly measure your progress: If you know the various local features which can be seen clearly along the shore. For instance, there is the golf course (which dates from 1883), the old Royal Norfolk Hotel, where Charlie Chaplin used to stay; the funfair, East Hayling Light Railway, the Lifeboat station and pub at Eastoke corner. If you have the right weather, it all seems to zip by at quite a speed because you run so close to it. Some people in houses on the seafront who probably had never seen SUP before came out on their balconies with binoculars and peered at us and we gave them a wave. As we approached Sandy Point, the south-eastern tip of the island, we could see West Wittering, and decided to speed up for the last mile or so. This is however another stage at which there can be some hazard. The currents here can exceed 6 knots on springs, and to get across from Hayling to West Wittering you have to cross a narrow channel where most of the marine craft heading out or into this exceptionally busy leisure harbour pass. Getting across this channel on a SUB can feel like crossing a main road with you ankles tied together. Take care, look around, and if necessary, wait for your opportunity. Because we were almost home, we rounded the headland with a bit more speed. Kevin was taking an aggressive line, cutting the corner as finely as possible. I heard him say “Err…it’s a bit shallow here”. Ten seconds later there was a grinding noise and a splash. Kev had run aground and taken a dive: we were each using the huge 13” “Finosauraus Rex” that comes as standard with the Jimmy Lewis 11 ft boards, and it is easy to forget how long they are. Recovering quickly, we crossed the channel as fast as we could back to the point at West Wittering. Customary dumb completion picture together. Straight to The Boulevard café for a massive, and much needed, meal. We took a very relaxed approach to the trip, enjoying the experience rather than aiming for speed. It took us a total of 4 hours 17 minutes, but that included the two 10 minute stops, i.e. just under 4 hours of actual paddling. The route is somewhere around 15 miles long, depending on how efficient your path is, so this was an average speed of about 3.75 mph. We did this on small neap tides, so had relatively little help from the tidal currents. But I would think that spring tides and perfect timing could add as much as 2 knots to your average speed. This should mean that some day a talented paddler on proper speed-oriented distance equipment might be able to break 2 hours for the trip. If that ever happens, I’d like to be the first to buy that person a drink. Avoid having to cross Chichester Harbour by starting and finishing in the Eastoke area of Hayling Island. There are a couple of very convenient car parks, which are also a lot cheaper than at West Wittering. We perhaps should have done this: it would also have saved us 20 minutes or so. Check out the very many regulations governing craft in Chichester and Langstone Harbours. SUP is still a relative novelty here, so please be careful not to act in such a way as to get us “noticed”, with attendant regulations, restrictions, fees, etc. Don’t even think about doing this without consulting out the tides, winds, and consulting a marine chart. Circumnavigation against winds, tides etc. would be a very punishing experience. It is easy to take a wrong turn, or navigate poorly. Yes, I know it doesn’t look like it on the map. But when you are at sea things do not look so straightforward, and mist can roll in surprisingly quickly. Take a map, compass, GPS, whatever. Access to the shore for people in cars wanting to rescue you if you can’t make it are especially limited between Hayling Bridge and the stretch of land out to Ferry Point. So best not to run out of steam on that stretch. Rescue wouldn’t be easy either between Sandy Point and the bridge, unless you knew Hayling well. So notify a local if possible. Next articleThe BBC film the ulimate tube ride.